yamauchi, of course, is much better known for his role in expanding the nintendo empire from a playing card manufacturer in the 1940's to the electronic gaming powerhouse that it is today. 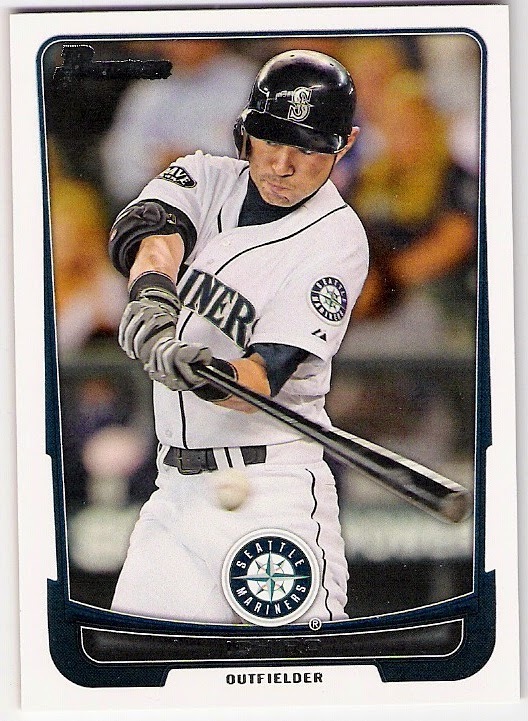 interestingly enough, despite owning the mariners for over a decade, yamauchi never did make it to a game in the states. 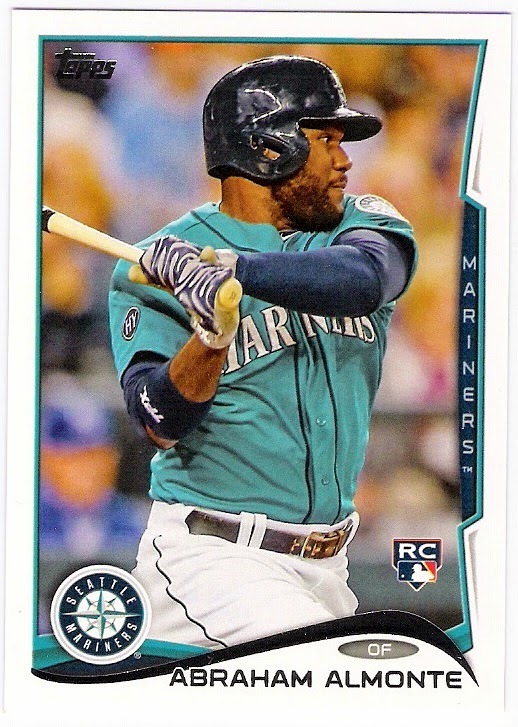 from their inception in 1977 through the 2010 season, the mariners had played almost 5400 games. and of those games, dave niehaus broadcast all but about 100 of them. 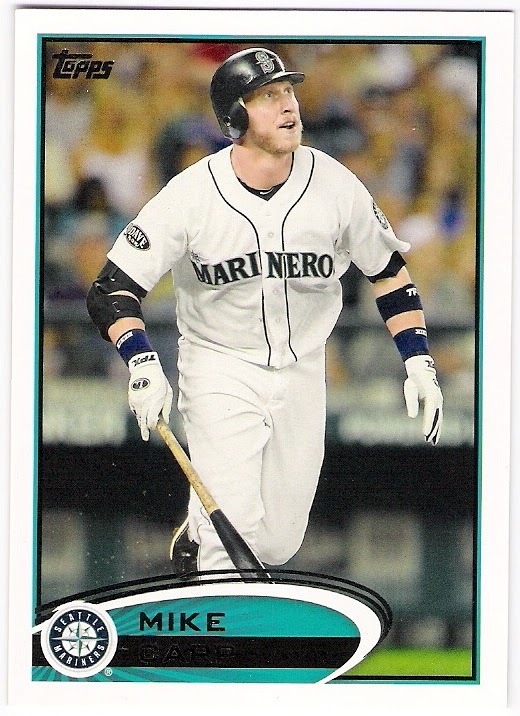 after niehaus passed away in november of 2010, the mariners added a memorial patch to their right sleeves to be worn during the 2011 season. 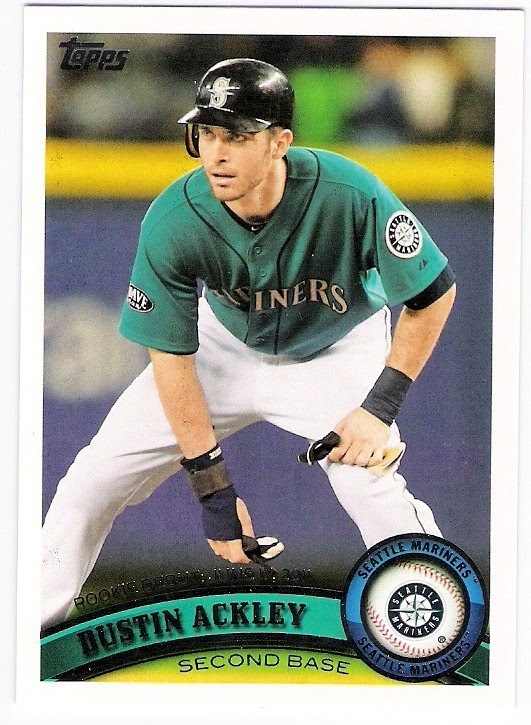 the memorial, an oval patch with niehaus' first name and his signature call 'my oh my' next to a microphone can be seen on dustin ackley's 2011 topps update card below. hank conger better watch his ears. and, hello alfredo griffin - i almost didn't see you lurking in the background! 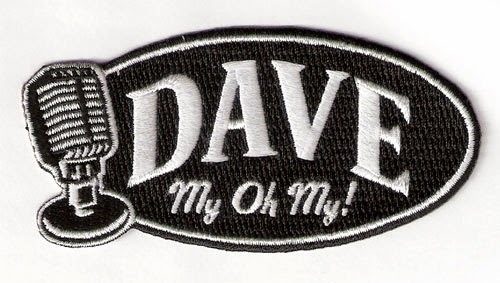 still, it doesn't give a good enough look at the patch to stick in the collection. are the two that represent the memorial in my collection. niehaus won the ford c. frick award in 2008, and is further memorialized by the mariners with a statue at safeco field. 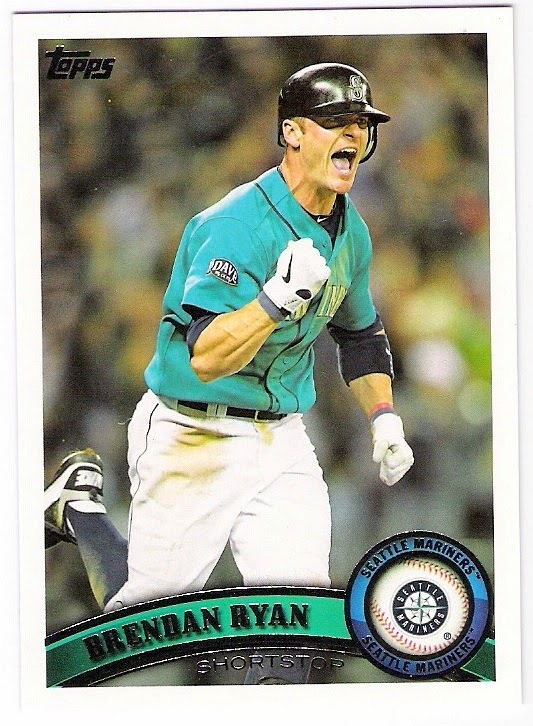 i am sure most fans have heard his famous call of edgar martinez' game and series winning double in the 1995 alds, but if he was anything like my favorite team's broadcaster, it was the non-dramatic calls and conversational tone of the day to day broadcasts that mariners fans must miss the most. 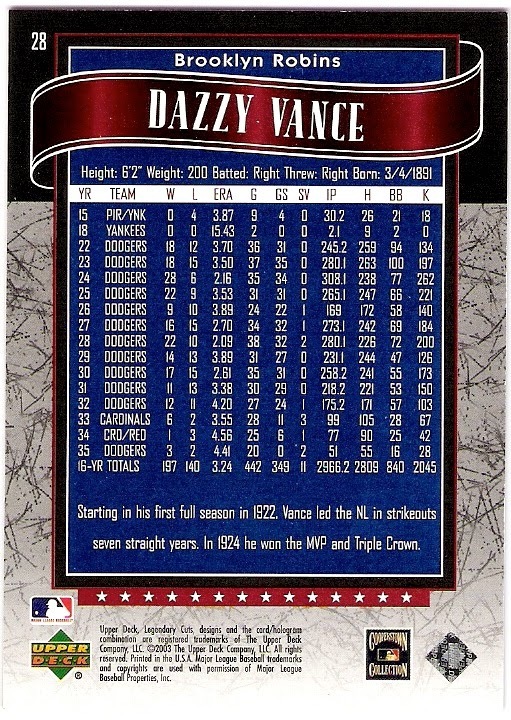 was dazzy vance one of baseball's greatest pitchers, as this 1982 tcma card suggests? i'm not sure. i am sure, however, that dazzy vance was a dodger double dipper. 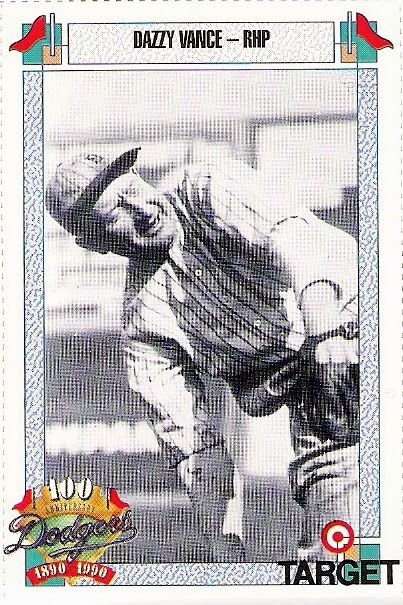 vance was 31 with an 0-4 lifetime record when he debuted for the brooklyn robins in 1922. he won 18 games that season, and led the league in strikeouts. 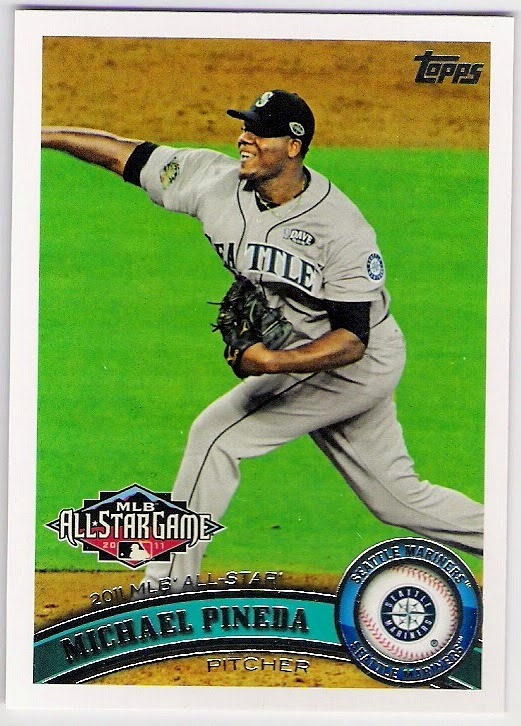 he would continue to lead the league in strikeouts in each of the following six seasons, becoming the first (and still the only) national leaguer to claim seven straight strikeout titles. 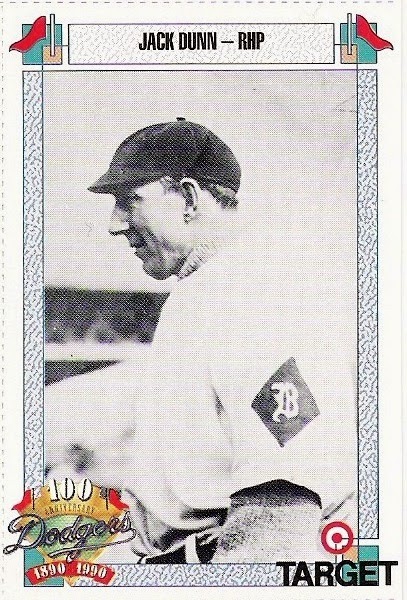 in 1923, vance again won 18 games, and then in 1924, he achieved the pitcher's triple crown - a league leading 24 wins, 2.16 era, and 262 strikeouts. he also won the league mvp award that year. vance led the league with 22 wins in 1925, and he led the league in era in 1928 and 1930, but never won another triple crown. 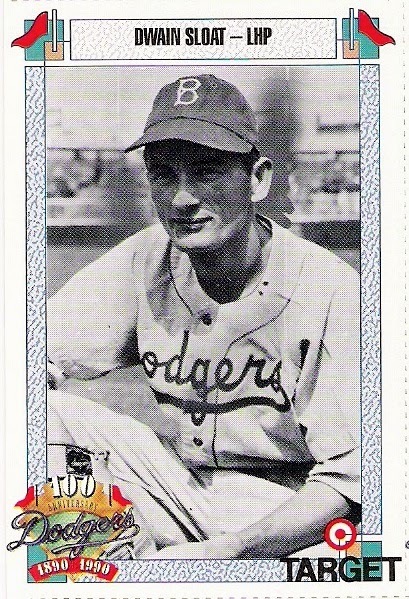 following the 1931 season, wilbert robinson retired and the robins became the dodgers. at 41, vance pitched in 27 games for the dodgers in 1932, but was just 12-10 with a 4.20 era. 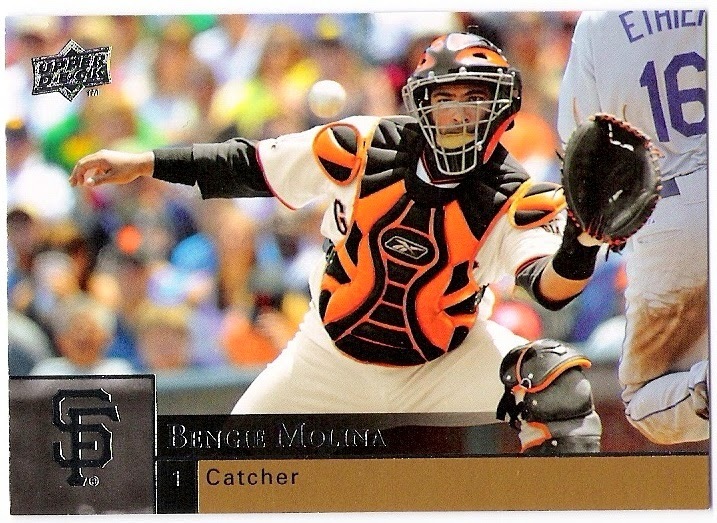 after the season, he was traded to the cardinals. vance helped the cardinals win the pennant in 1933, and he made an appearance in game 4 of the world series. the cardinals lost that game, but beat the tigers to give vance a world series title in his only trip to the postseason. 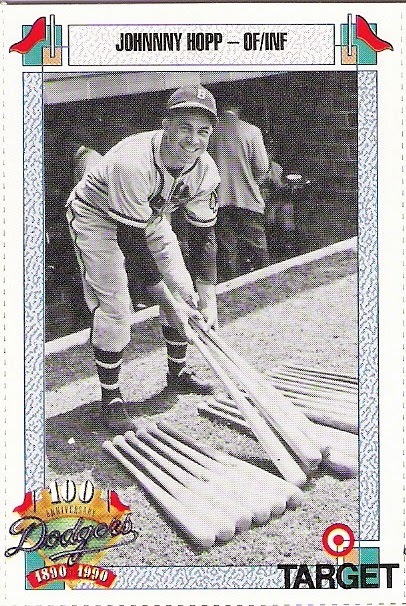 the following year, vance began the season with the reds, but returned to the cardinals in june of 1935. they released him in the spring of 1936, and he was quickly signed by the dodgers. 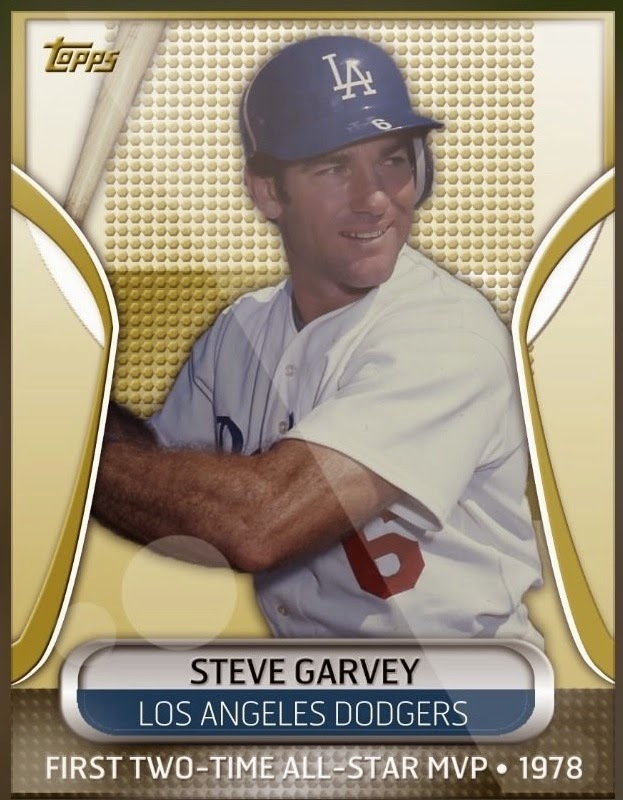 remember, only two of vance's 12 seasons with brooklyn occurred when the team was known as the dodgers, so it is fitting that the robins are his team noted on the front of the card. 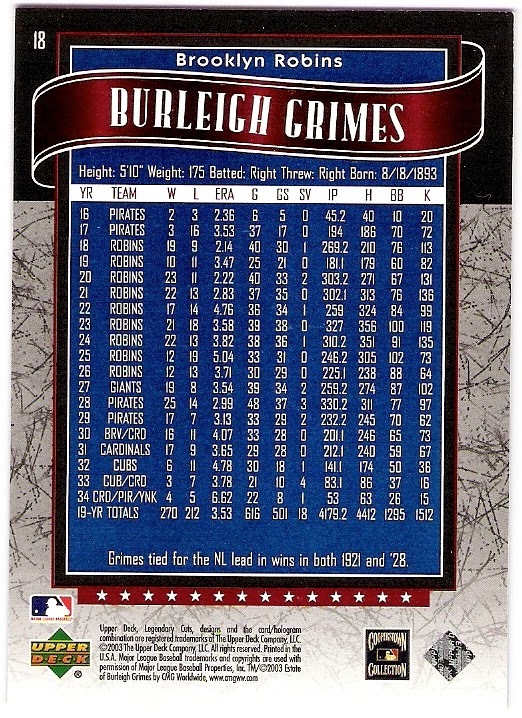 one of vance's teammates for about half of his time with the robins was fellow hall of famer burleigh grimes, who was also featured in the 2003 upper deck sp legendary cuts set. 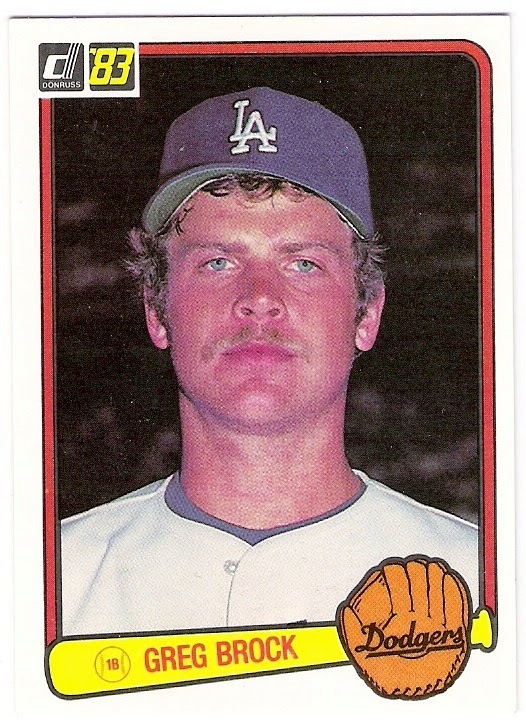 overall, vance won 190 games for the franchise, more than any other brooklyn pitcher and behind only don sutton and don drysdale in franchise history. 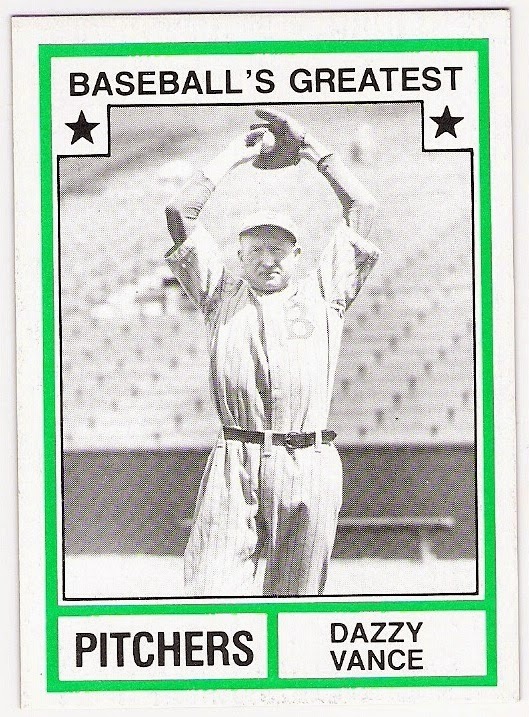 his 1918 strikeouts for the team are also the most of any brooklyn pitcher, and he trails only the two dons and sandy koufax on the franchise leader board in that category. 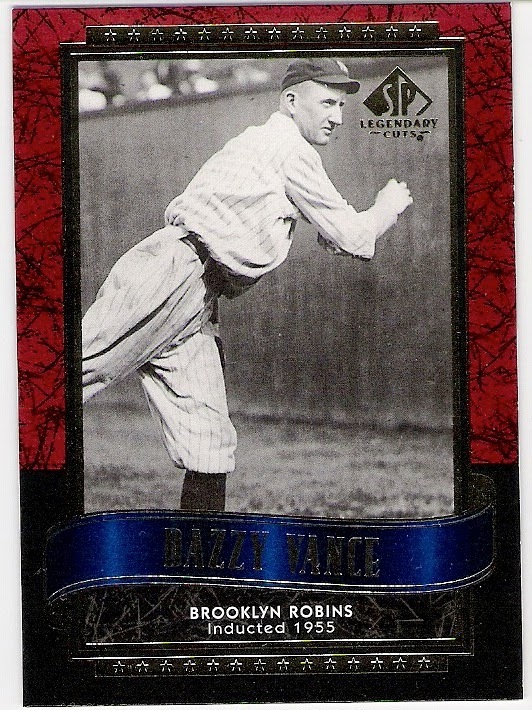 so, even if vance is not one of baseball's greatest pitchers, he most certainly is one of brooklyn's greatest. 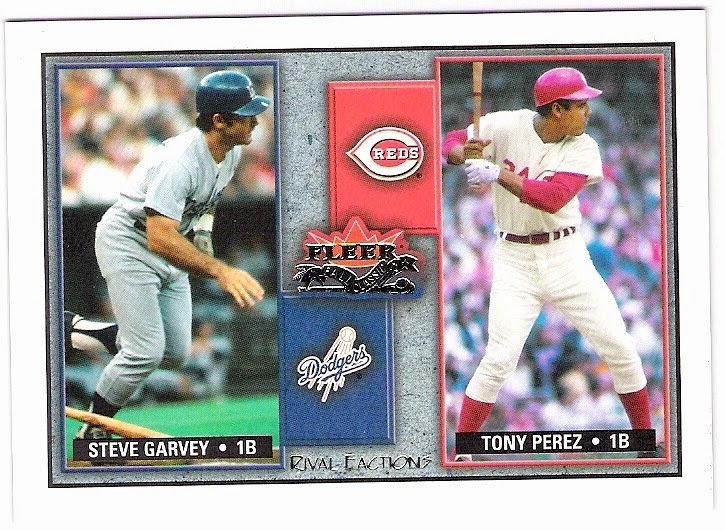 time for another sheet of cards from the set that keeps on giving - the 1990 target dodger stadium giveaway set. as always, thanks to baseball reference for providing some information about some of these heretofore unknown to me players. 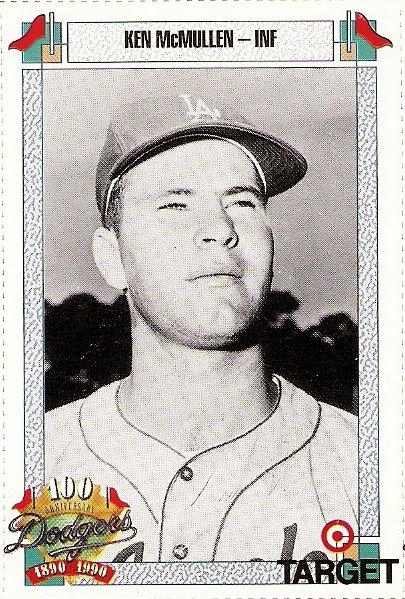 demeter's first major league hit came in his second big league at bat, and it was a home run off of don liddle of the cardinals in september of 1956. demeter only appeared in three games that season for the dodgers, but he returned to the majors in 1958 and stayed with the dodgers until he was traded to the phillies early in the 1961 season. in 1959, he hit three home runs in a game agains the giants - one was an inside the park job, and the third one was a walk-off. dunn was a pitcher who also played in the field from time to time. 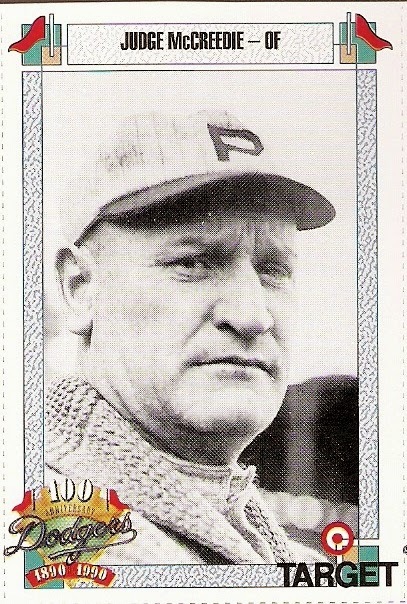 he entered the big leagues with the brooklyn bridegrooms in 1897 and remained with the franchise until he went to the phillies during the 1900 season. 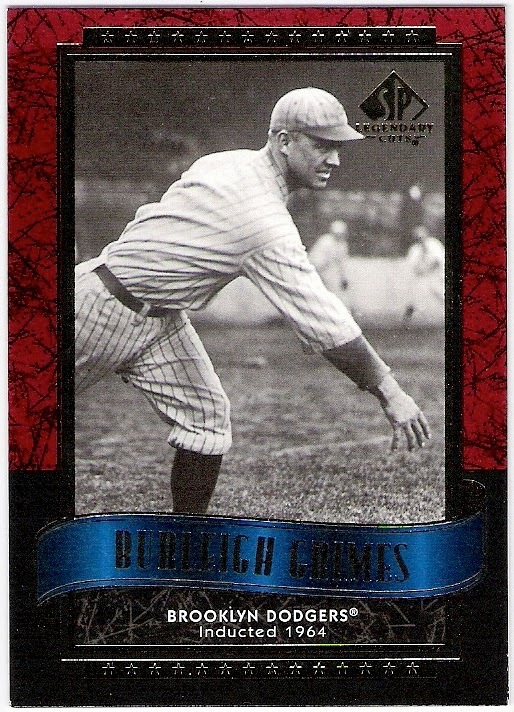 he hit .238 in his 3-plus seasons for brooklyn, but also won 56 games, including 23 in 1899. dunn later replaced hughie jennings as the manager of the baltimore orioles in the eastern league, and actually became the team's owner a couple of years later. they moved to the international league, and dunn led them to seven straight titles. grissom pitched six seasons for the reds, culminating in a world series appearance against the yankees in 1939. the reds lost, but grissom must have made an impression on new york as he was traded to the yankees in january of 1940. he appeared in five games for the defending world champions, pitching 4.2 scoreless innings, before he was claimed on waivers by the dodgers. with brooklyn the rest of the way, grissom went 2-5 despite a 2.81 era, and he threw a 2-hit shutout against the phillies on the final day of the season. 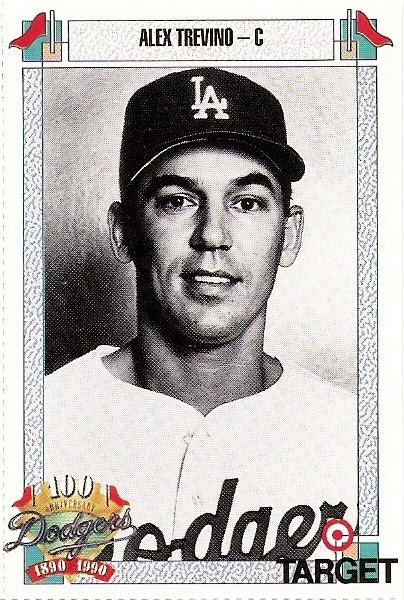 in 1941, he pitched in four games for the dodgers and had an era of 2.38, but was traded to the phillies. heep was the guy the mets received when they traded mike scott to the astros, straight up, in 1982. a lopsided trade in hindsight, but heep did help the mets win the world series in 1986, so it wasn't all bad. 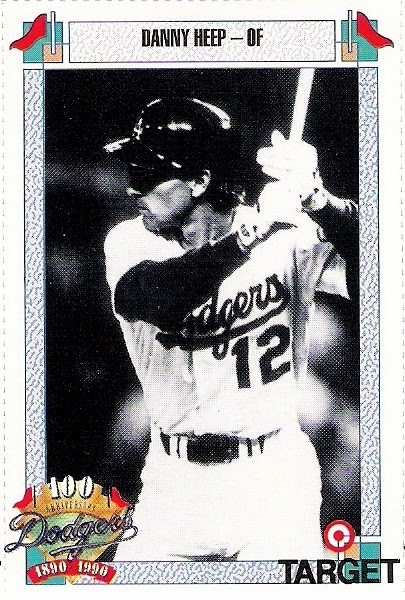 following his triumph in 1986, heep signed with the dodgers and played for them in 1987 and 1988. he was used mostly as a pinch hitter but also made starts at first base and in the outfield. 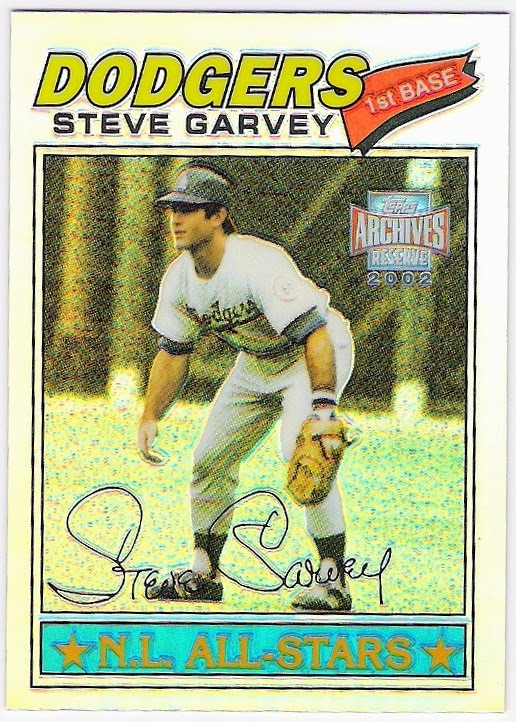 he even got to pitch in a game during the 1988 season - he threw two innings against the astros in july, giving up a 2-run homer to ken caminiti in the process. 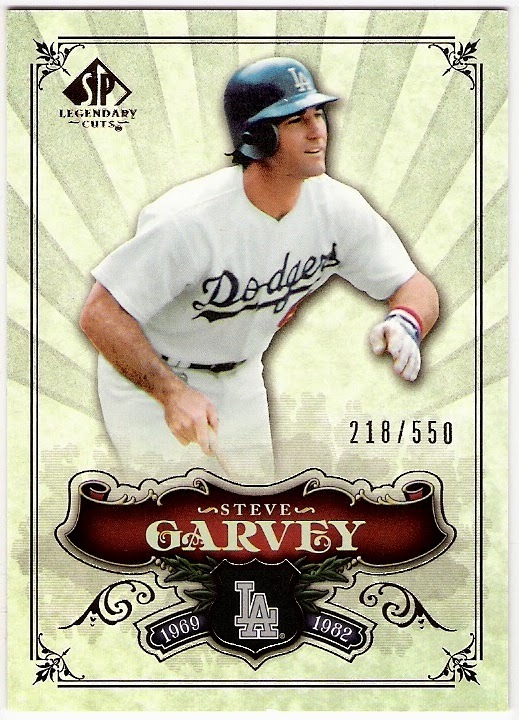 he had some pinch hit appearances in the 1988 postseason for the eventual world champion dodgers, and served as the dh in game 4 of the world series. happy hooton was the mvp of the 1981 nlcs as he won both of his starts against the expos without allowing an earned run. 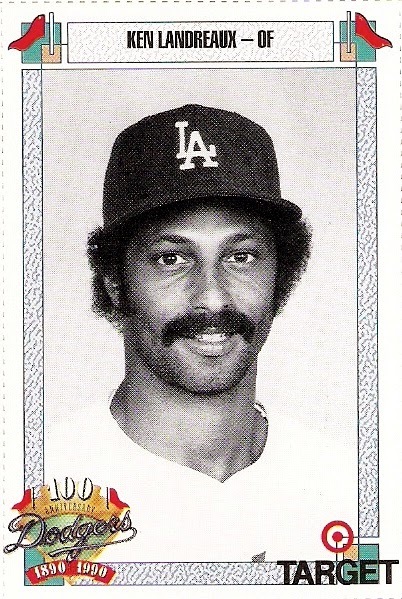 he joined the dodgers in 1975 and remained a fixture in the rotation through the 1983 season. 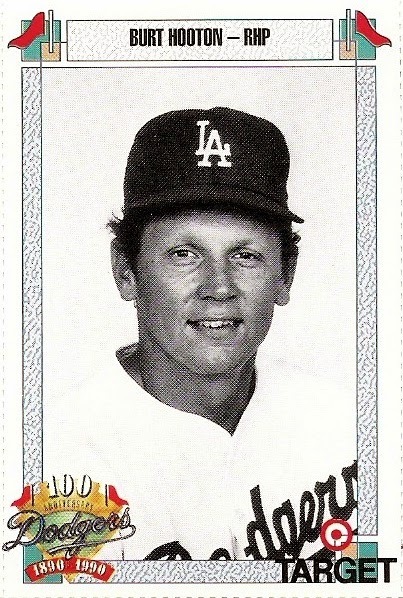 in 1984, he spent most of his time pitching out of the bullpen and left the dodgers for the rangers prior to the 1985 campaign. as a dodger, however, hooton won 112 games with a 3.14 era, and he nearly wrecked this fan's shoulder thanks to my trying to throw a knuckle-curve like hooton. target gave hopp an extra 'n' in his name there. 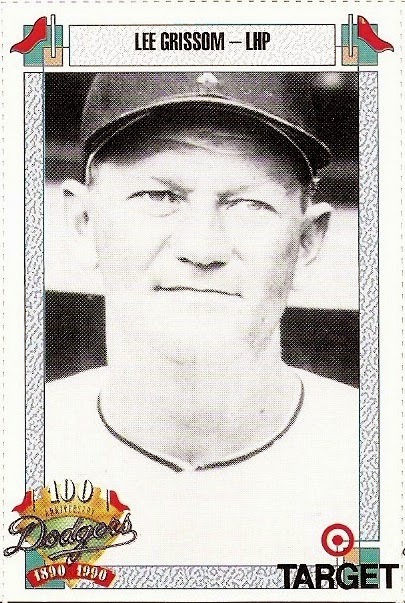 hopp was involved in the 1949 trade with the pirates that sent marv rackley to pittsburgh, but was voided a few days later. as a result, rackley became a double dipper, and hopp only appeared in 8 games for the dodgers. 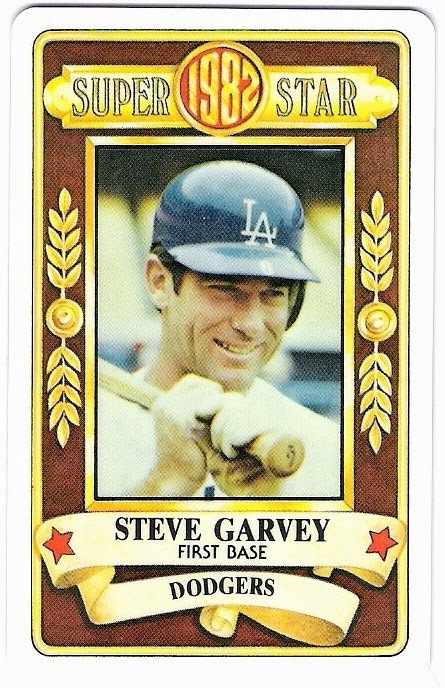 in those games, he was held hitless in 14 at bats. maybe burt shotton had the trade voided due to hopps' performance. 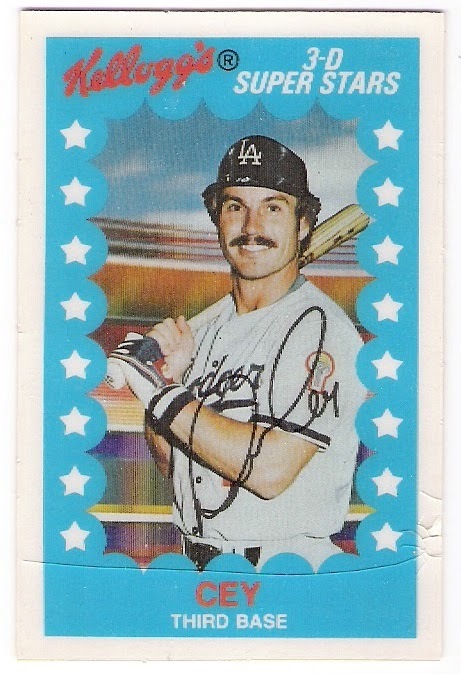 landreaux is best remembered by me and many other dodger fans for catching the final out of the 1981 world series. 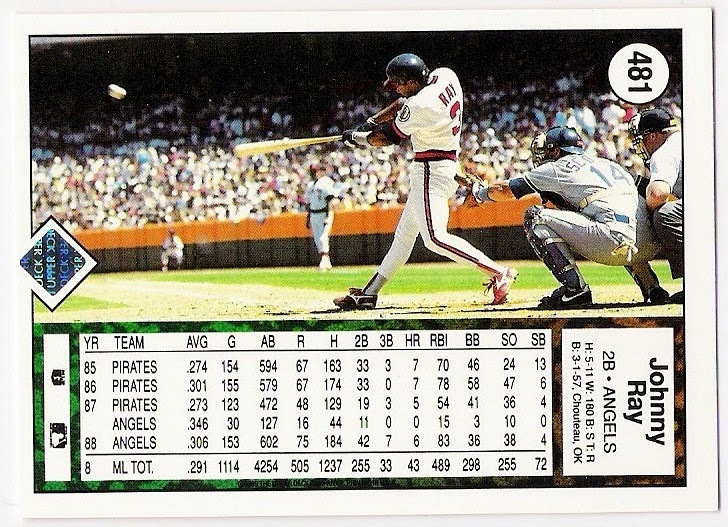 he was also the main guy that the twins received from the angels in the rod carew trade prior to the 1979 season. 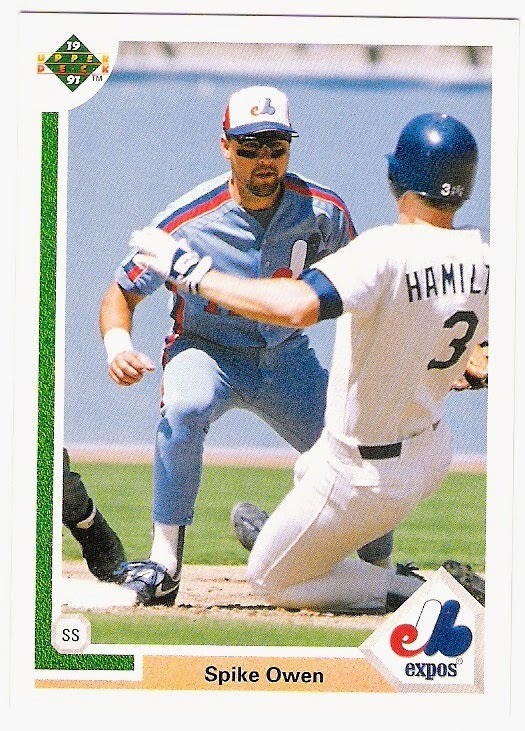 two years later, the dodgers acquired landreaux for mickey hatcher and a couple of minor leaguers. landreaux spent seven seasons with the dodgers, most of which were spent as the team's regular center fielder. i've told mcmullen's story before so i won't rehash it here. 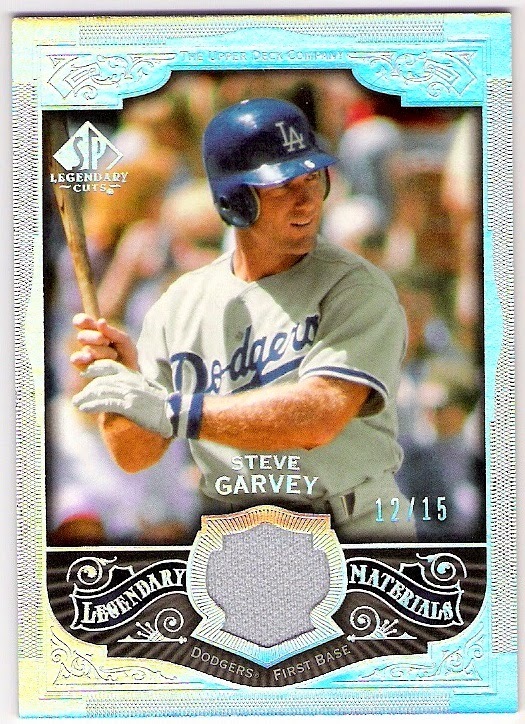 suffice it to say that the pride of oxnard has had a big impact on dodger team collectors, thanks to his rookie card companion. mccreedie (baseball reference spells his name 'mccredie') was an outfielder for the 1903 brooklyn superbas. 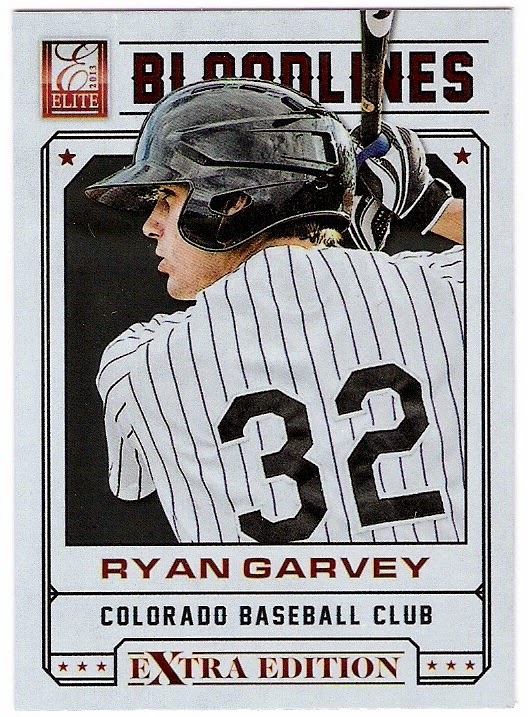 he hit .324 in 56 games for brooklyn before he was traded to baltimore in july. 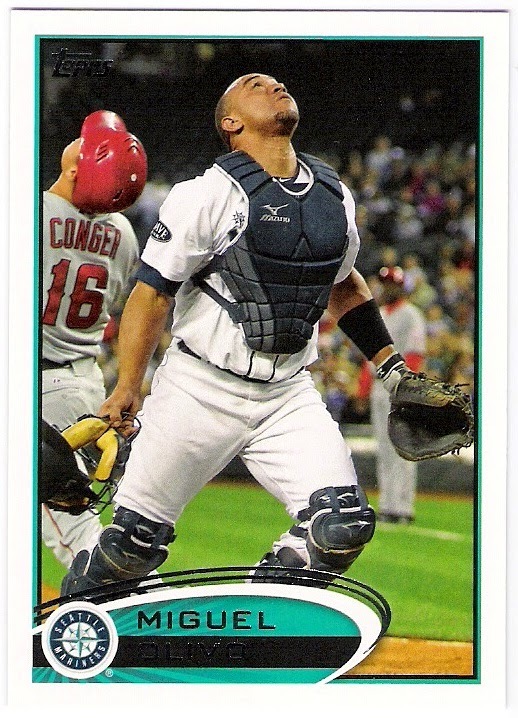 somewhat curiously, he never made it back to the major leagues. in 1904, he found himself in portland playing in their pacific coast league team that wound eventually be known as the beavers. in 1905, judge took the reins and became their player/manager, a role he held through the 1913 season after which he gave up playing and was just their manager (save for a couple of appearances in 1916 and 1917). in all, he spent 20 years managing in the pacific coast league, most of which was spent in portland. he is a member of the pcl hall of fame. 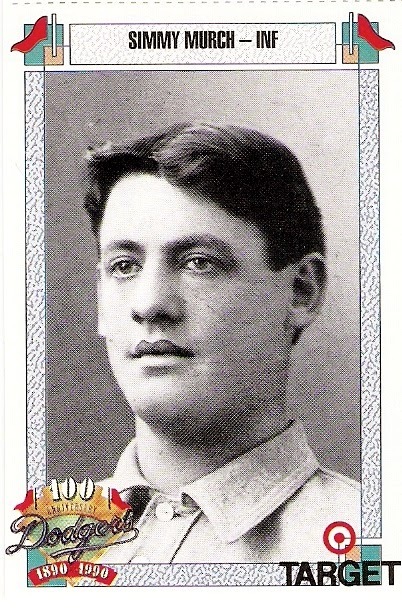 murch played in 6 games for the 1908 brooklyn superbas following a couple of seasons with the cardinals. 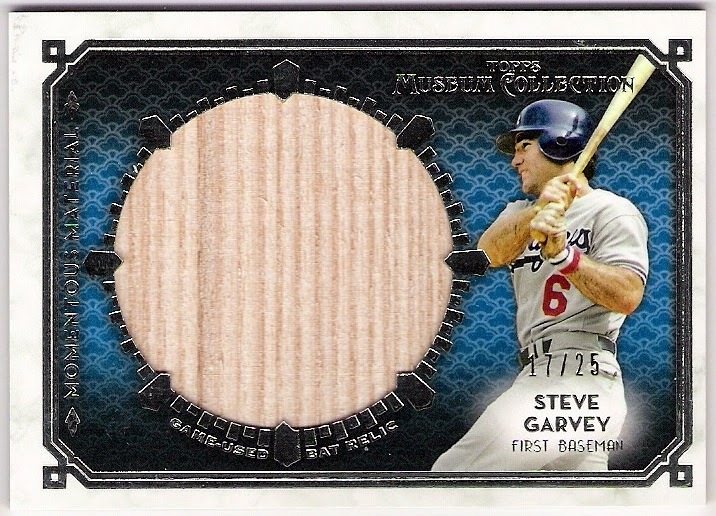 he hit .182 with a double while playing first base in his stint with brooklyn, his last in the major leagues. 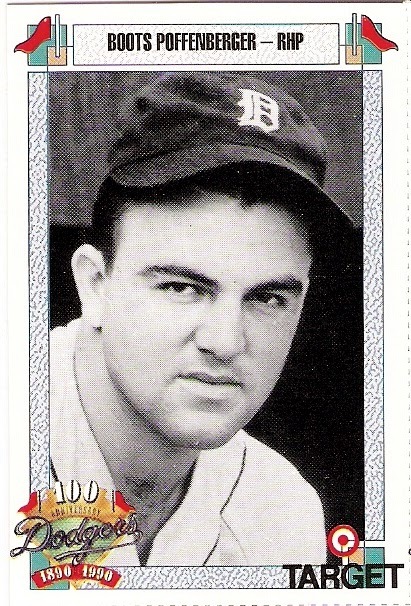 poffenberger obviously played for the tigers - he did so in 1937 and 1938 - but the dodgers claimed him on waivers at the start of the 1939 season. for brooklyn, boots (real name cletus) pitched in three games, including one as a starter. he had no record and an era of 5.40 in those appearances. and yes, this boots was made for walking - he walked two of the four batters he faced in his dodger debut. 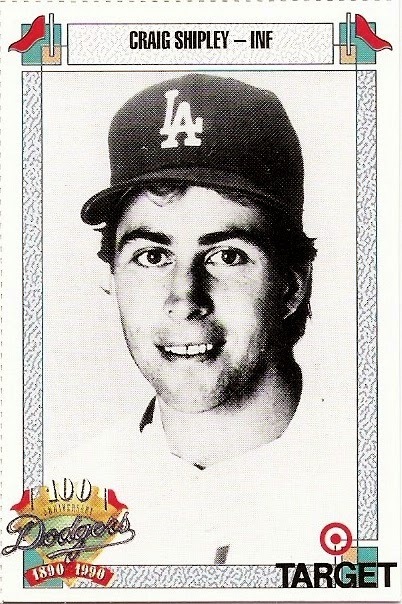 shipley became the second australian (and first in over 100 years) to debut in the major leagues when he appeared in a game for the 1986 dodgers. 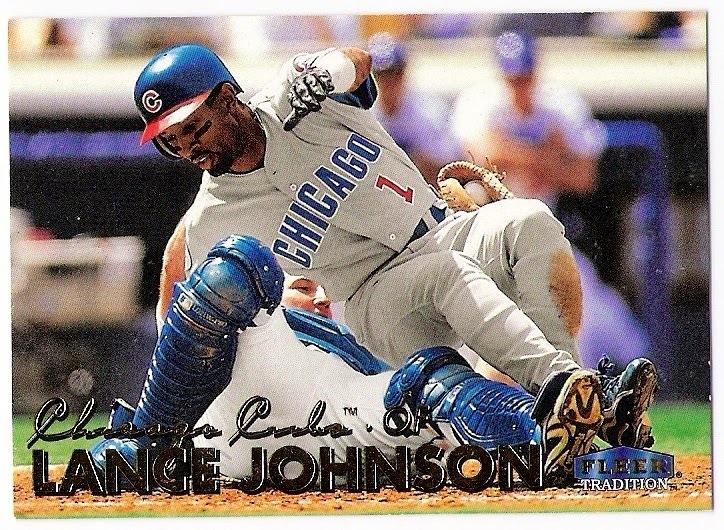 he hit .111 in 12 games for the blue, and returned in 1987 to hit .257 in 26 contests. the dodgers traded him to the mets, and he later found success playing for the padres and working in the front office for the red sox. aka lefty sloat. 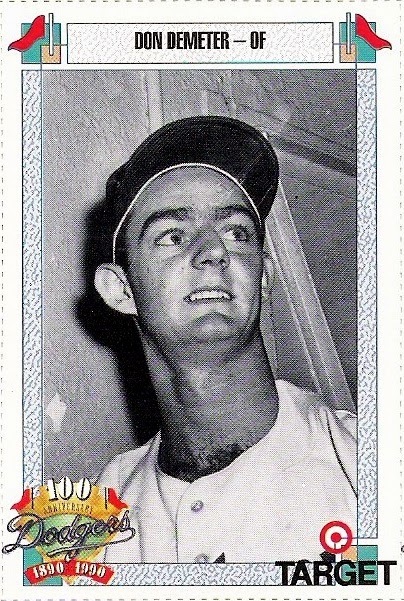 he pitched in four games for the 1948 dodgers, including one as the starter. he was 0-1 with an era over 6. he was claimed by the cubs in the rule v draft prior to the 1949 season and did not return to brooklyn. 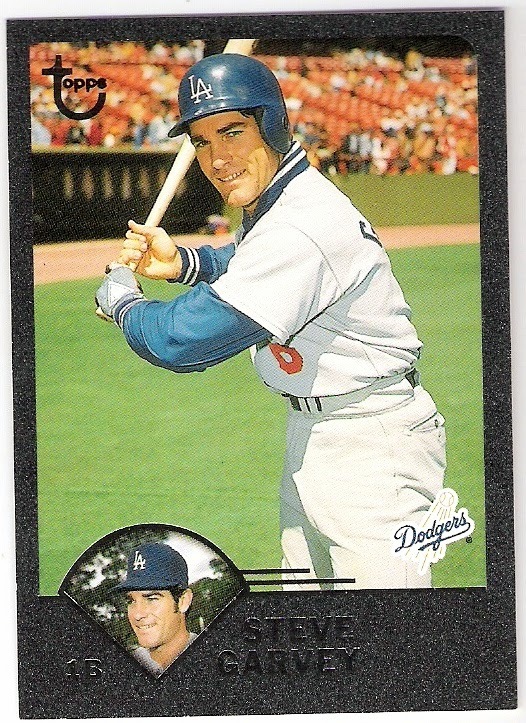 in a rare trade with the giants, the dodgers acquired trevino in exchange for candy maldonado prior to the 1986 season. 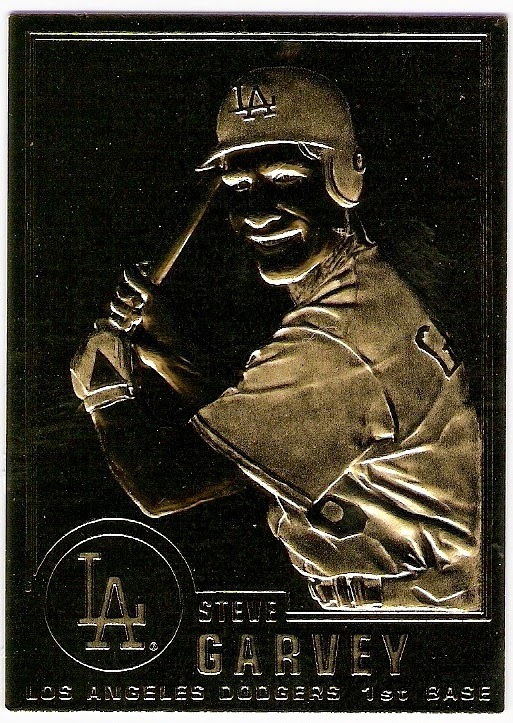 trevino spent the '86 and '87 seasons with the dodgers, playing catcher behind mike scioscia. he received some significant playing time for a backup, appearing in 161 games over his two seasons with the club. …a double dipper post coming up later! 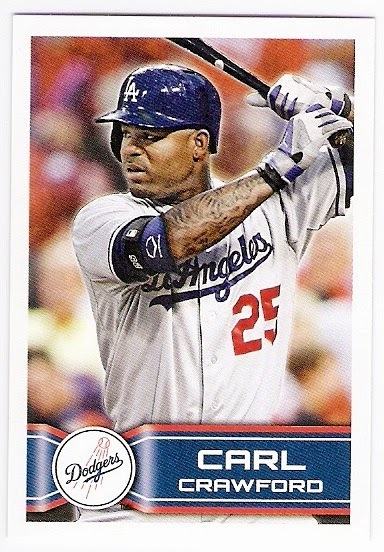 which features andre ethier lurking in the background while also beating the throw home. prince held on to the ball, but i believe johnson was safe, assuming that this is the lone scoring or potential scoring play from the april 26, 1998 game that featured these two guys. it looks like it was a sunny day in socal that day. 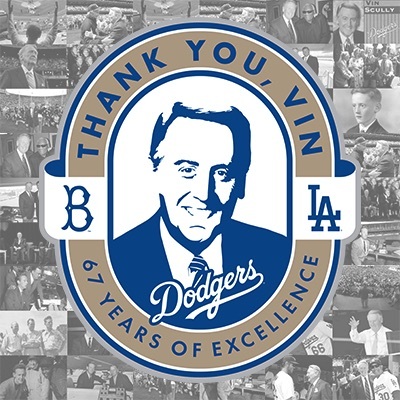 thanks to the annual freeway series that precedes every regular season. he did not, but he did get to appear on the card for which i am thankful. i decided sometime in may that i needed a better way to track trades. previously, i had used email folders to remind me of trades that had been agreed to - i had one folder for 'i have sent' and one for 'they have sent' and one for 'completed', and i would move the email around based on the status of the trade until it was in the 'completed' folder. it worked for most of the last 5+ years, but now there are some packages that show up without warning (which is great), and so email is not all inclusive when it comes to trades. we didn't know what that meant. the guy at the card shop didn't know either. 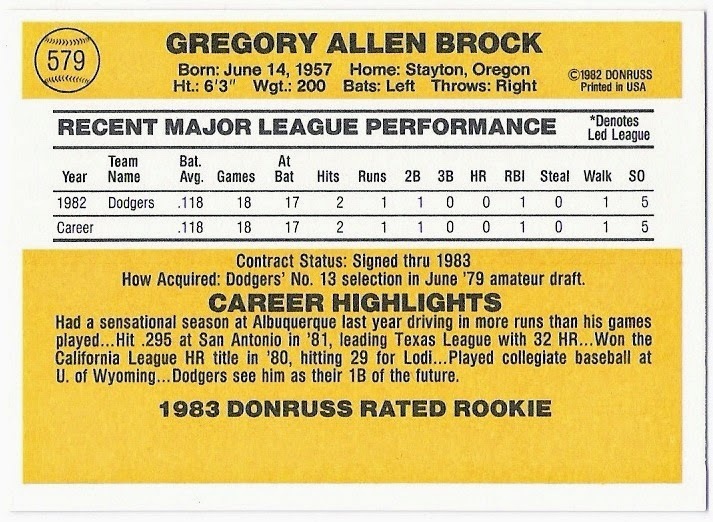 it became clear in 1984 when donruss moved the designation to the front of the cards that it was just another way of saying 'future star' and the like. i put together a return package and sent it off - you can read about it here. and i recently got the return package in the mail. i've also received some cards from dennis as part of his recent giveaway that i will show off later. anyway, in order to help me track my trades and not lose track of who i owe, i have added a 'trade tracker' gadget to the blog. it's over there on the right (if you're reading this with the mobile version of the site, you need to select the web version to see what it). it's pretty self explanatory, i think. 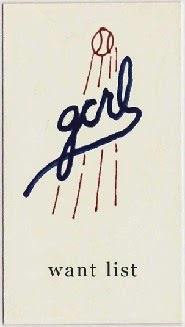 'incoming' are cards that i have received, and 'outgoing' are cards that i have sent. (1) indicates which package was sent first to initiate the trade, and (2) indicates which package completed the trade. any incoming packages marked with a (1) means that i owe cards to the sender. so, you can see that i currently owe not only dennis, but also bo and pat at the hot corner (since march! ), and you can also see that i have recently started and completed trades with fuji and the rhubarb runner. i will probably leave completed trades up for a month or so (or until i publish the trade post which sometimes takes longer). in addition to cards for dennis, bo, and pat, i am also working on packages for people (patp, nick, dollar store), and i don't know if these are return or initial packages to be honest. i will assume that they are all return packages just in case. the whole point to this is that i don't want to leave anyone who has sent me cards without a return package. if i owe you cards, please leave a comment or send me an email, and i will add you to the tracker and send some cards. like i said earlier, i tried my best to keep track, but i may have missed someone at some point. and, if we haven't traded before (or even if we have - and thanks very much, by the way), rest assured that i will complete a trade so let's make it happen. 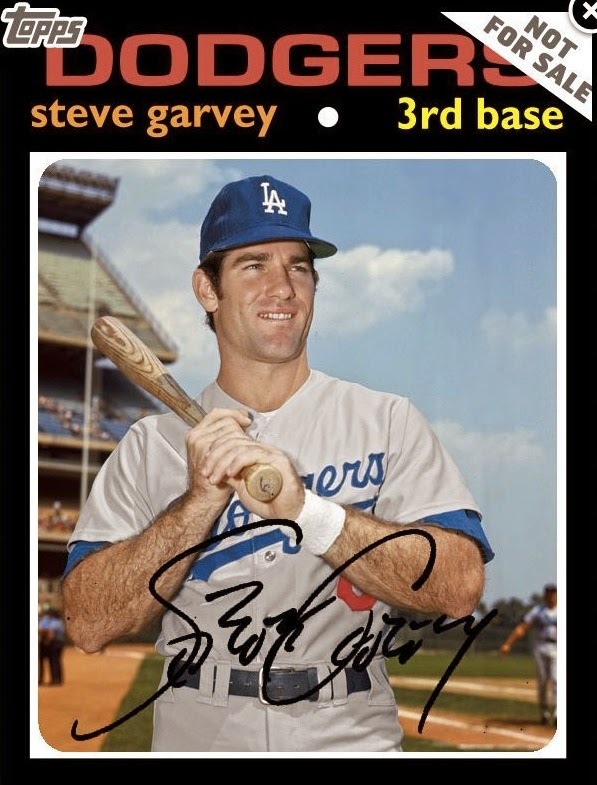 i've been working on getting the contents of my steve garvey binders scanned, as i plan to show the entire garvey collection on the blog yet this year. during that time, i've put some cards away that had been in boxes rather than the binder, and i've also picked up a few new cards for the collection. 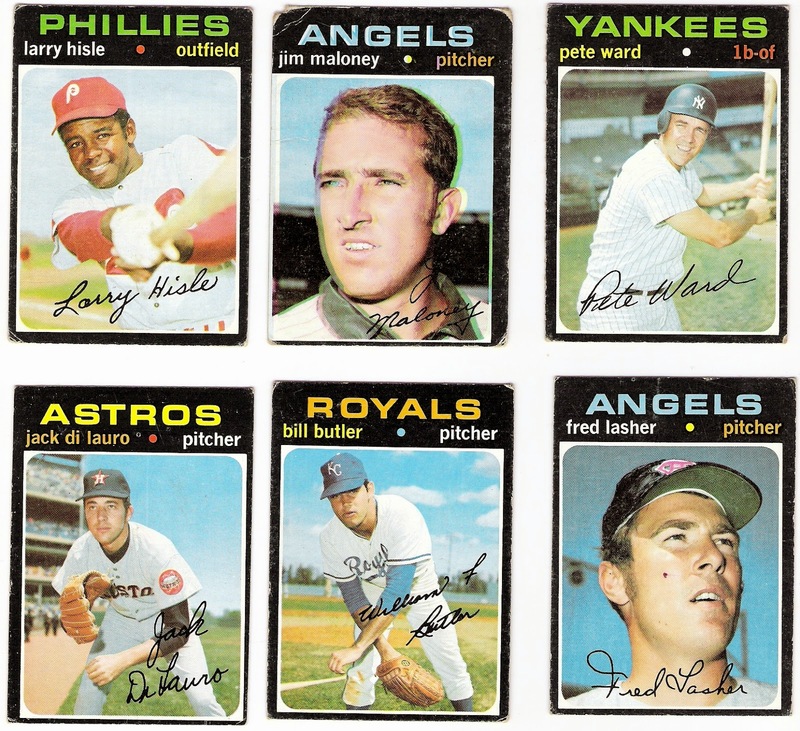 some, as you will see, are real cards, one is a recycled card, and some don't really exist. 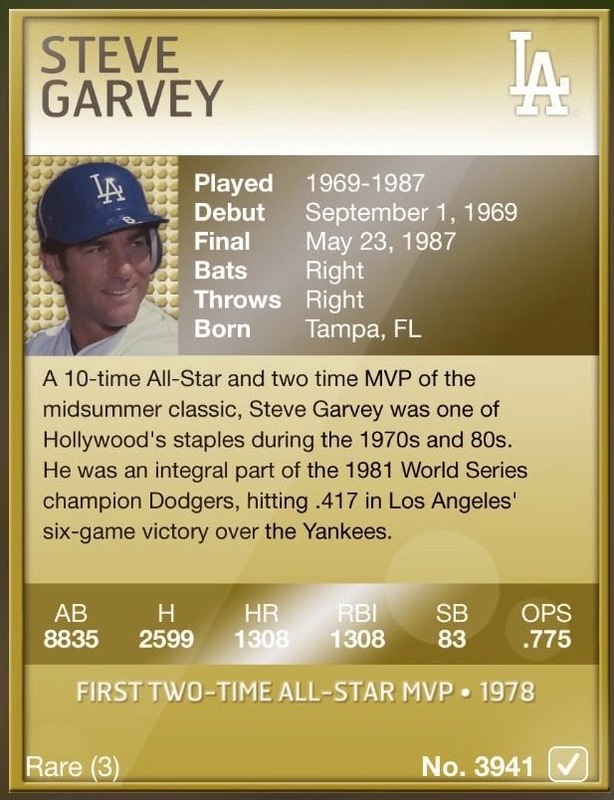 i think there is a /99 version of this card, too. 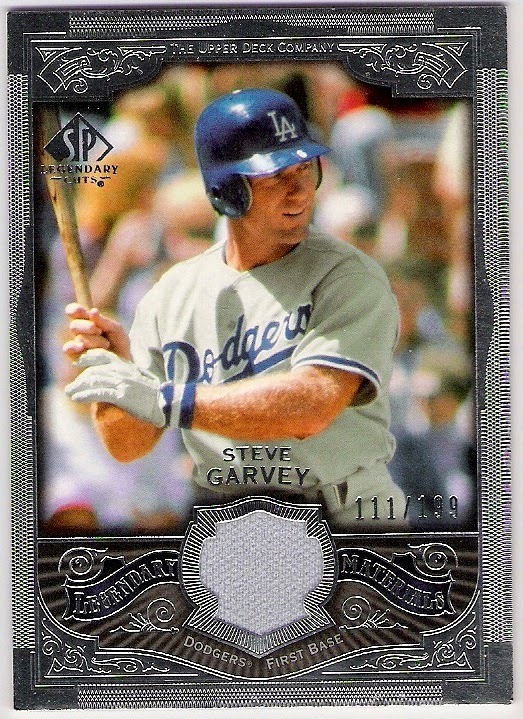 i've added the missing jersey card to the nefarious 9, by the way. 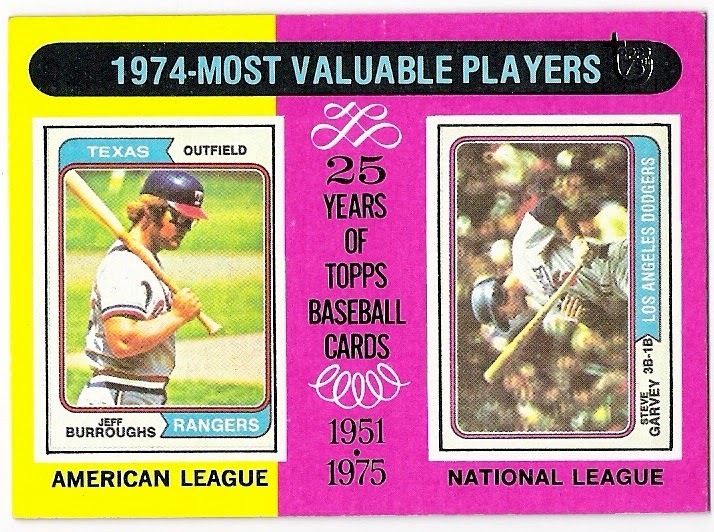 these are reminiscent of credit cards, and i think were only produced in 1981 and 1982.
i think these were only available on sheets. 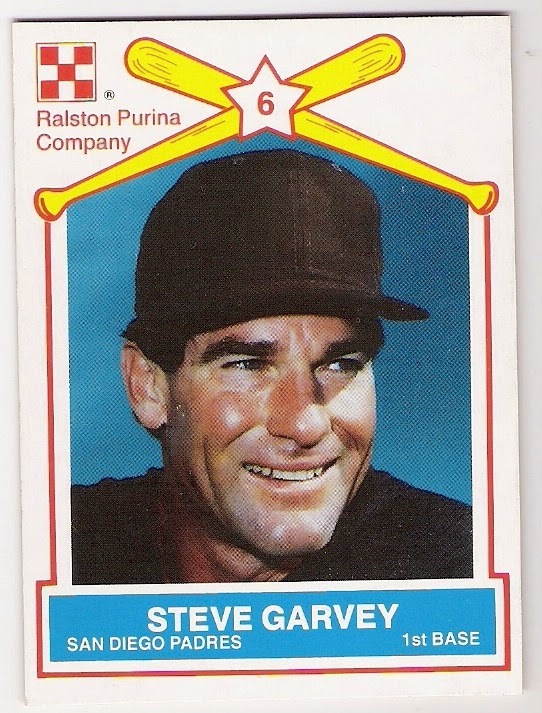 they differ from the regular ralston purina cards in that they don't have any text there in the upper right corner. i took this guy out of it's plastic case. 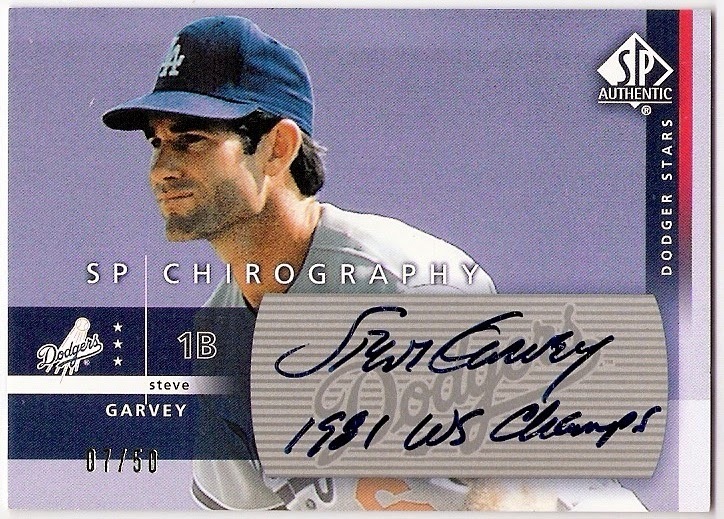 here's an on card auto from 2003 upper deck sp authentic. 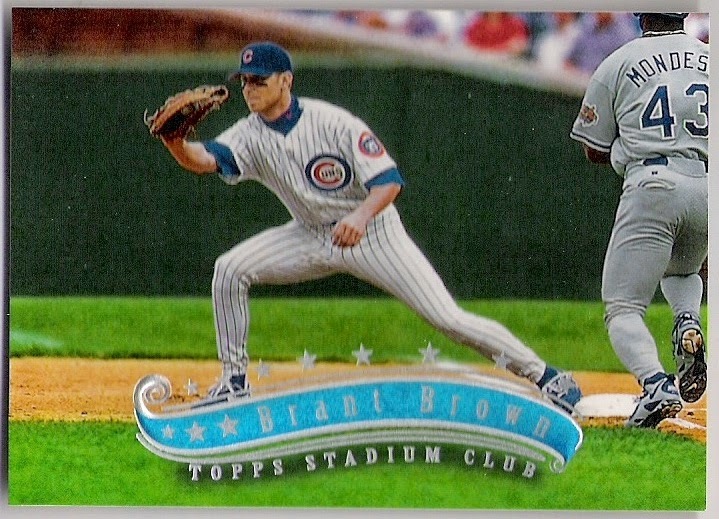 this card was part of the sp chirography set, in which there was a 'dodger stars' subset. 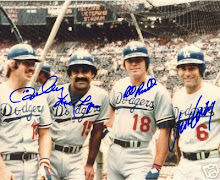 lots of good autos for dodger collectors like me, and believe me, i collected them. 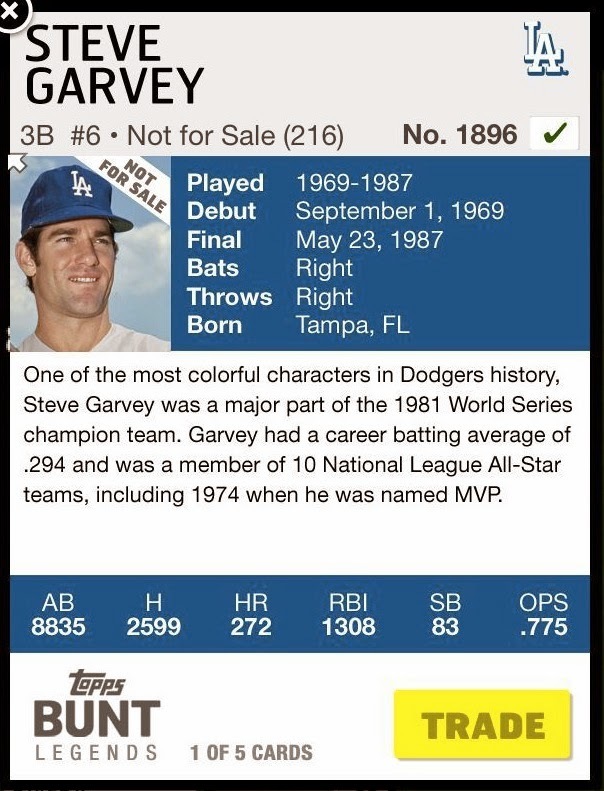 according to topps, over half of garvey's hits were solo home runs. 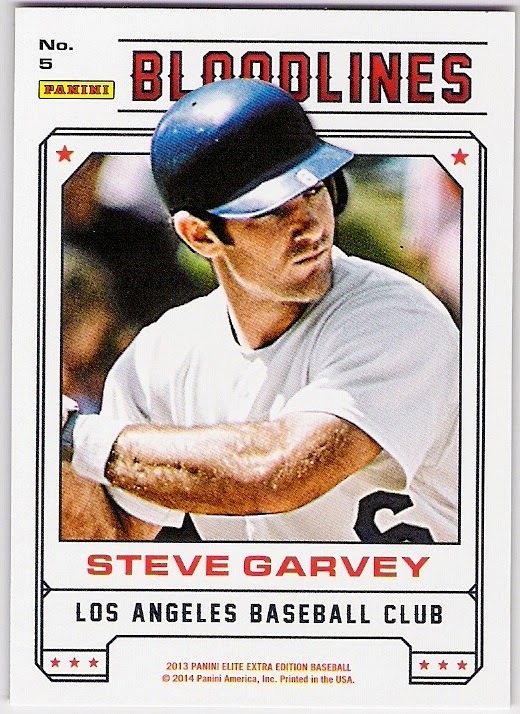 steve garvey is his padre, after all.